oa tourism is one of the most popularly known words to travel freaks throughout the world. Goa as a tourist destination offers a multi-dimensional attraction. 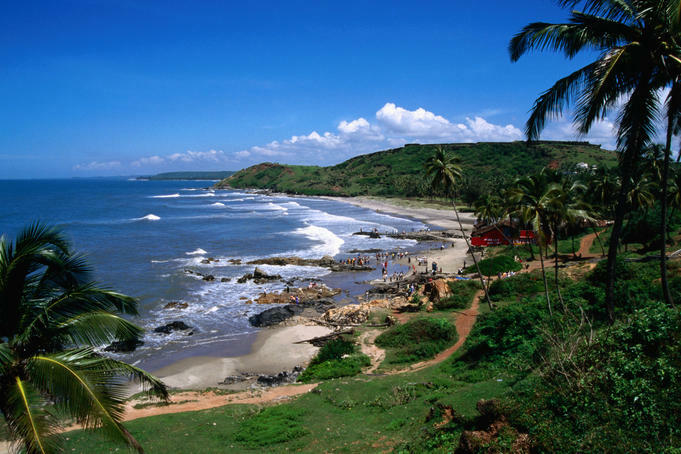 Starting with the exotic beaches to the beautiful natural exhibits, there is no dearth of tourist attractions in Goa. Apart from the breathtaking natural beauty, tourism of Goa also offers a number of other attractions like beautiful temples, churches, bustling nightlife, various festivals, shopping areas and casinos. All these attractions give a complete shape to the tourism industry in Goa. Hence, it manages to draw a lot of tourist by offering something for tourists of all types. As said earlier, Goa tourism has no dearth of attractions. Embedded with a Portuguese flavor, Goa tourist attractions will surely be a great experience for tourists. The presence of wide variety of tourist attractions has actually helped in the continuous rise in the number of tourists to Goa. However, unless and until you are aware of the type of tourist attractions in Goa, you won’t be able to explore the beauty of Goa in a proper way. Hence, let’s have a closer look of Goa tourist attractions. Anjuna Beach – Popular for its full mon beach parties, the Anjuna Beach in Goa offers an exotic beauty. Moreover, the beach is very close to the other tourist attractions like Albuquerque Mansion, built in 1920. You can also visit the Chapora Fort and the Mascarenhas Fort as these places are also close to the beach. Baga beach – The presence of a number of water sport facilities in the Baga beach is the prime reason for a huge number of tourists to visit the place. Moreover, the 30 kilometer stretch of coastline is a treat to the eye. Arambol beach – Located close to the city of Mapusa, the beach offers a taste of tranquil beauty. The beach also has the added attraction of the hot water springs, and a large number of shops nearby. The beach is a great place for food lovers as there are a huge number of shops in the area that serves exotic sea food. Dona Paula beach – Dona Paula’s tourist attraction goes much beyond natural beauty as the beach also has facilities for a number of water sports. Hence, the particular beach Goa has multi-dimensional attractions. Colva Beach – As said earlier, Goa possesses a number of isolated beaches as well. Among those, the Colva beach is the most prominent one. The serene beauty of the beach added with calm surrounding offers the perfect place for relaxation. Calangute beaches – Popular as the ‘Queen of Beaches’, the Calangute beach is a great experience for tourists as the golden sands, the palm trees make it a picturesque place. The fired prawns and the beer available will make it a truly relaxing experience. Monuments in Goa also occupy a significant place in the map pf Goa tourism. Being a Portuguese colony, Goa also boasts a rich history. The various monuments and historical structures of the place reflect the rich history of the place. Hence, tourists often visit these monuments in Goa to get an idea about the history of place. Moreover, it also reflects a flavor of Portuguese architecture. Thus, tourists who are interested in various forms of architectures visit these monuments to get an awesome experience. Moreover Goa tourism also offers visits to a number of museums in Goa. These museums are the best place to visit in Goa to get a clear idea about the history and culture of Goa. You can also enjoy beach volley ball as this particular sport is very popular here and have the perfect surrounding to play this sport.